This holiday season, all of my family came to visit at some point--and at one point, there were 8 adults all hanging out in my (relatively small) house. We are fairly diverse in our interests and occupations, but when I looked at the books that everyone had brought with them, I realized that our literary interests tend toward two genres--science fiction and fantasy. And, in fact, our big family outing was a group excursion to see The Hobbit, followed by a discussion of the film over ice cream. "[The film] is overwrought with violence and quite juvenile. 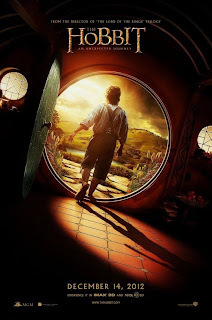 It's neither for children nor adults; in fact, it's almost like they were trying to bring the Shrek genre of movies into The Hobbit. But I did like the question and answer scene with Gollum--I thought they did that very well. Also, who will finally teach the orcs how to fight?" "I'm very much looking forward to the newest Wheel of Time book and now respect Sanderson as an author in his own right. The magic system is one of hte best that I've read and keeps me on my toes." "I enjoyed this film, but there is no way I would get on the boat at the end of the movie. The probability that someone who exhibits multiple symptoms of mental illness actually invents a time machine appears to me to be so low that I just wouldn't get on that boat." Note: This comment provoked a rousing discussion about whether this statement was logically sound. "An entertaining movie; however, once you start to think deeper about the time travel mechanics and count the loops, it starts to unravel around you." "A recommendation from a friend who read it in 2 days. After reading the first few pages (the prologue), I'm very intrigued as well and can't wait to find out what's in the tent." "I loved Jemisin's Inheritance trilogy, and so I was thrilled to receive the first of her latest series as a Christmas gift. While I'm finding the names a bit challenging to keep straight, I really love how the novel deals with the incredibly difficult issue of how sometimes, certain acts are viewed by different cultures in fundamentally different and irreconcilable ways. Once again, Jemisin is using fantasy to address provocative real-world questions." What did you and your family read or see over the holidays? Let us know in the comments!